When it comes to promoting your small business, there is no better way than using video marketing. A well-produced video makes it easy to show all of the features of your product, display how simple it is to use, and engage potential customers. Video content also presents an interesting option for a membership website or a video sharing site. Thankfully, WordPress is a great platform that makes it very easy to create a video powered website thanks to its vast selection of quality plugins and themes. But before we proceed with our selection of the best WordPress video themes, we should spend time going over some of the determining factors you can use to make a decision on which theme is best for your site. And if you’re a web designer or digital marketer working with a client, then you’re in charge of directing them through the process of choosing the best theme for their video optimized site. Start by walking them through the key features they should look for. Considering that the use of smartphones and tablets is rampant, you need to make sure the buttons in the video player aren’t so tiny that they can’t be clicked on smaller handheld devices. Any theme you choose must be cognizant of this fact and accommodate accordingly. Compared to any other content, video requires more time to load. And showing more than one video on a page can quickly become a cumbersome experience. Make sure the theme is optimized to load fast. Choose a theme that offers plenty of customization options to make sure you can integrate it seamlessly with your brand and create the look, feel, and layout that will make you stand out from your competition. In the case of video themes, shortcodes are especially useful because they allow you to quickly fetch any video data you need. Uploading videos to your own web host can quickly burn through your precious disk space. If you plan on adding a lot of videos to your website, then it’s important to choose a theme that allows you to directly embed videos from third-party sites like Youtube, Vimeo, or DailyMotion. 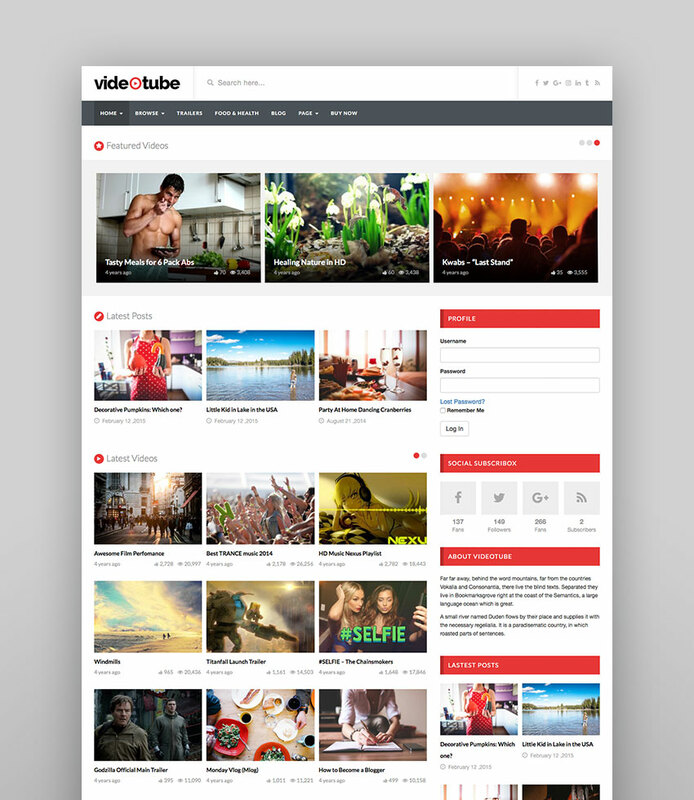 Videotube is a responsive WordPress video theme designed to make it easy to create a website centered on video content. It features a clean and modern platform where you can upload a video from websites like Youtube, Vimeo, DailyMotion, Hulu, and any other video sharing site that supports the oEmbed protocol. This theme comes with 10 different homepage layouts, six pre-existing color schemes, support for video thumbnails, support for user-submitted videos, Visual Composer, and a powerful Theme Options panel which allows you to customize the theme to your liking. With vertically oriented thumbnails reminiscent of Netflix, the screenshot below is taken from one of the many demos Videoly offers. 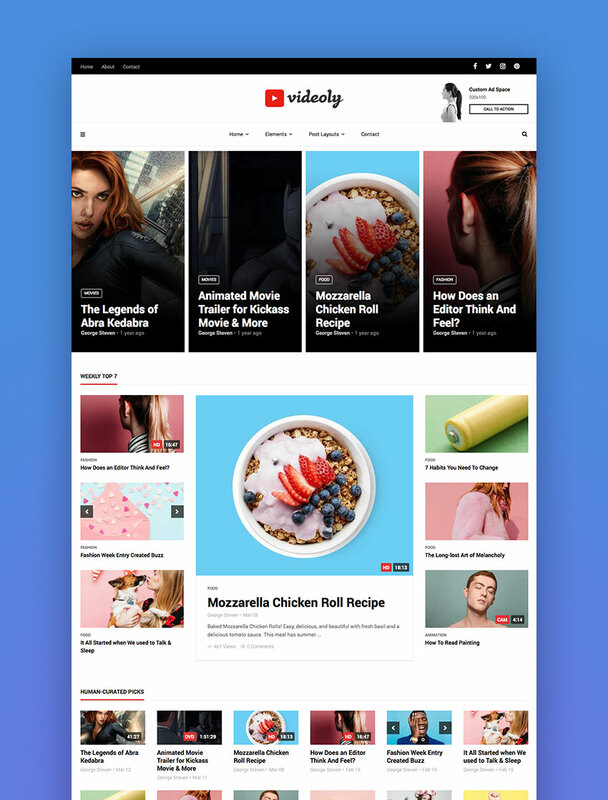 The nine homepage layout variants and six post page layouts are easily created with a drag-and-drop builder, and they’re all focused on great visuals and excellent performance. Videoly has too many features to list, so go and check out the item page yourself, then download it with your Envato Elements subscription! “Crisp design, single page goodness” according to its makers, and they’re absolutely right. Wide open and calming, with high contrast and a very clear UI for your visitors. Waves takes a step back and lets the video content do the talking. 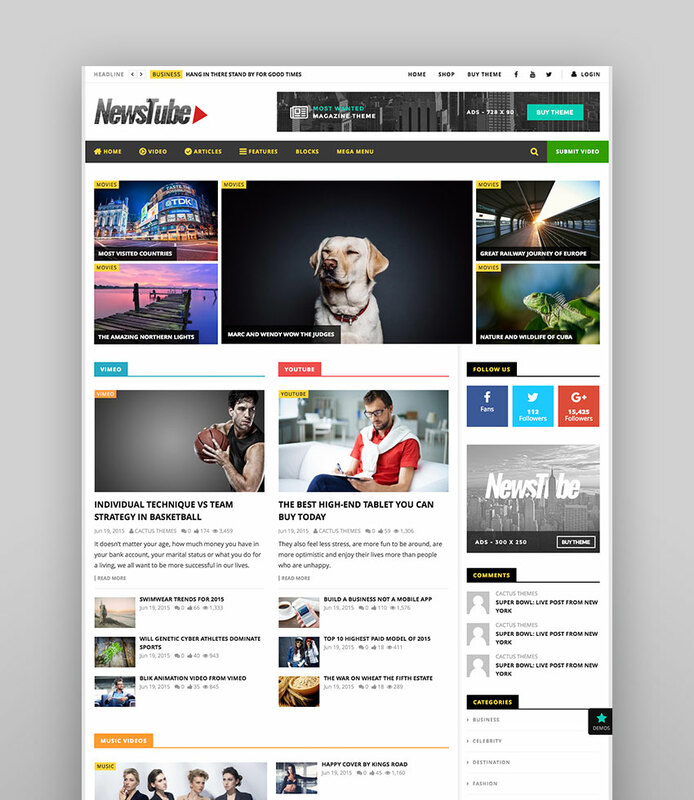 NewsTube is a clean and well-organized theme suited for magazine, blog, and video sites. It features a responsive, retina-ready design and comes with flexible theme layouts and extensive Theme Options, which allows you to easily customize your website exactly the way you want. 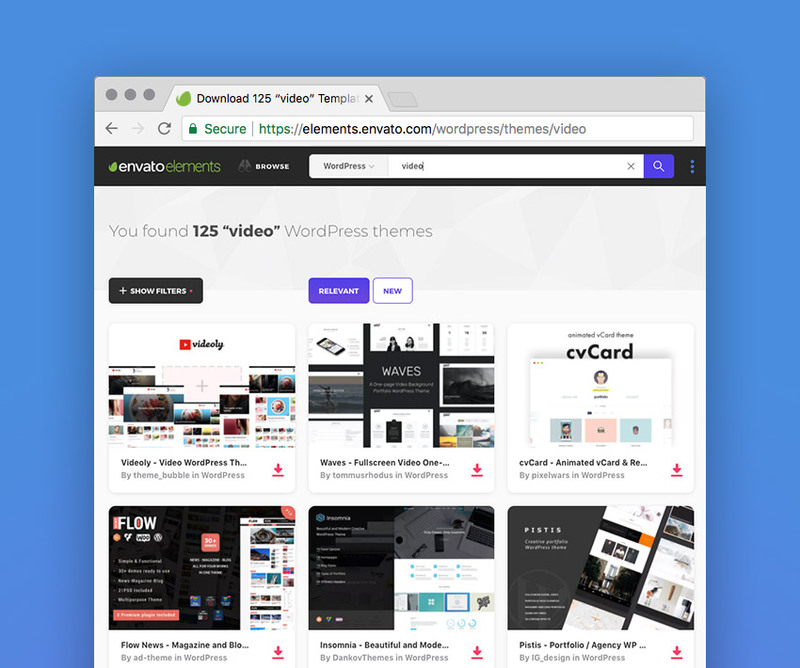 NewsTube offers support for videos from many popular video sharing sites as well as the ability to submit videos from the front-end, create video channels and playlists, or import YouTube Videos and Channels to your website. Other features include unlimited theme layout variations, dozens of shortcodes, theme options, live post, multi-page posts, pre-defined ads positions, user engagement widgets, social networks connection, SEO optimization, and more. 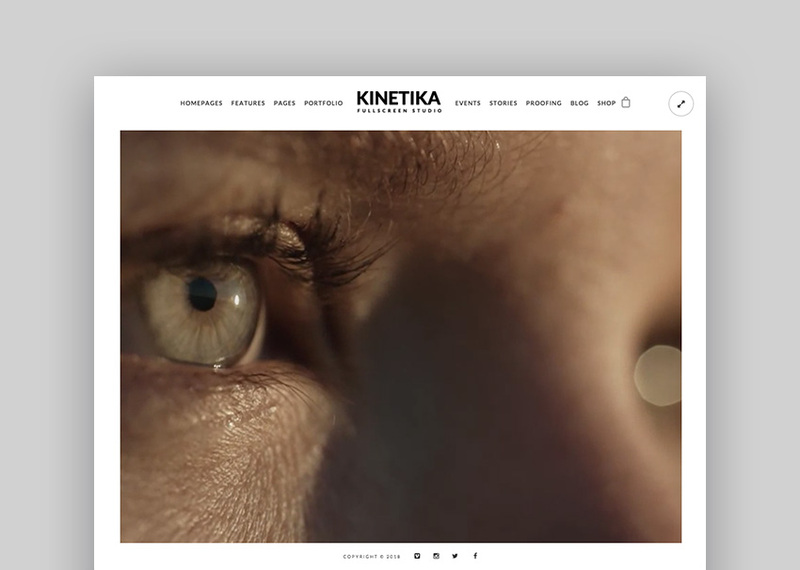 Kinetika is a responsive, fullscreen photography theme which supports WooCommerce and includes built-in events posts, photo proofing galleries, and a variety of portfolio showcase functions. The Kinetika theme has the ability to display image slideshows and videos as page backgrounds with page opacity control per page. Other features include page builder, customization options, shortcode generator, custom widgets, and modules. On top of that, the theme is SEO and speed optimized. 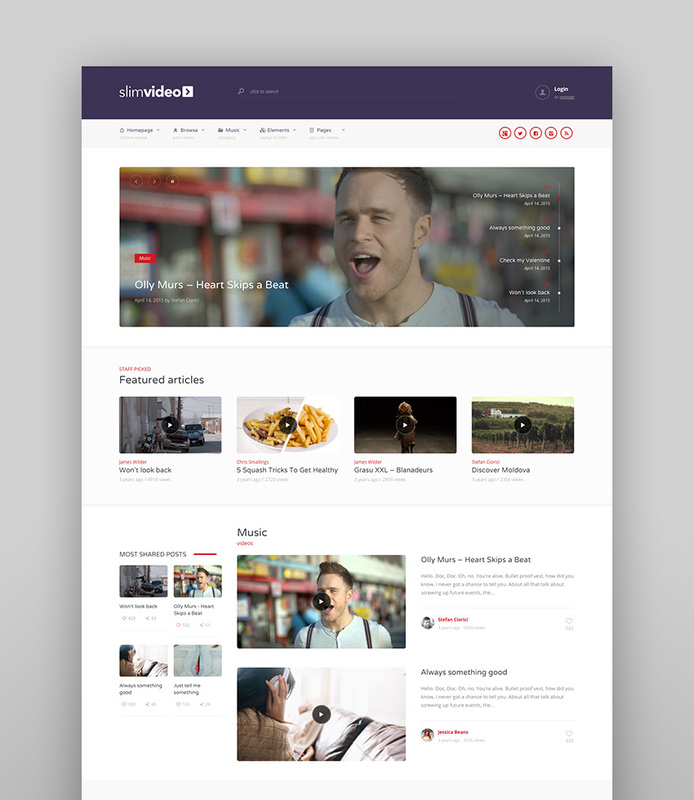 SlimVideo is designed to create a stunning website with a focus on featuring video content in a clean and elegant way. SlimVideo is responsive and comes with a powerful page builder which allows you to create unique layouts on a page by page basis. 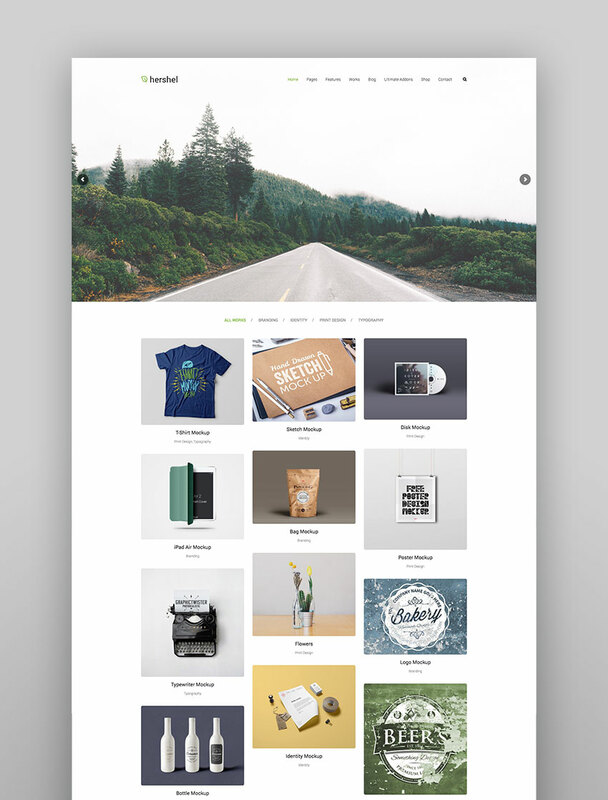 The theme features three custom post types, seven different post views, unlimited headers, footers and sidebars, the ability to submit videos on the front-end, support for WooCommerce, four different sliders, and much more. Designed with promoting musicians, DJs, singers, and producers in mind, FWRD comes packaged with audio players and events functionality–it also comes with a couple of beautiful options for displaying videos. The screenshot below is taken from the grid layout, but there’s a list layout variant too. Take a look at the brutal (and brilliant) use of the grotesque “Karla” font for the video headings! 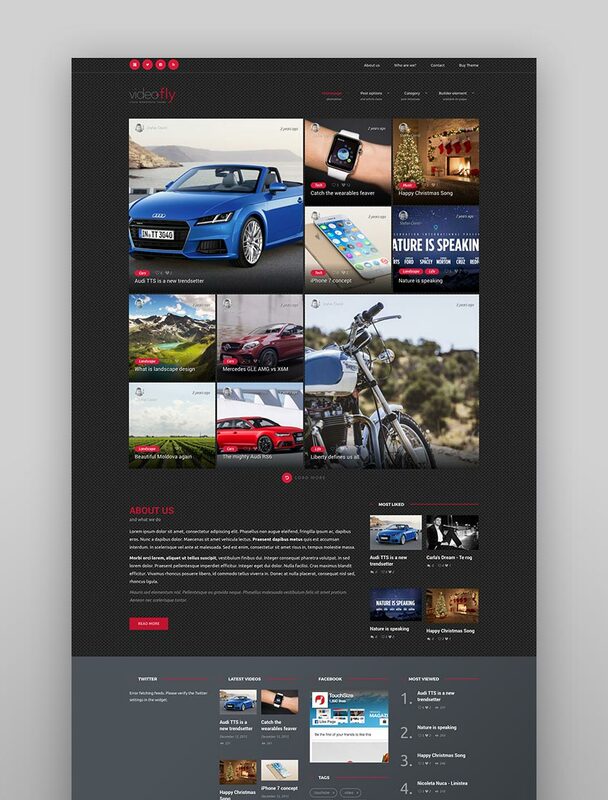 HyperX is a stunning, responsive theme created with freelancers and agencies in mind. It offers a unique way to display your products and portfolio, along with the ability to utilize videos on portfolio and gallery pages. HyperX comes with multiple predefined layout options which enable you to get your site up and running in as little time as possible. The theme includes an options panel built straight into the WordPress customizer and Visual Builder plugin which allows you to create different layouts on the fly. 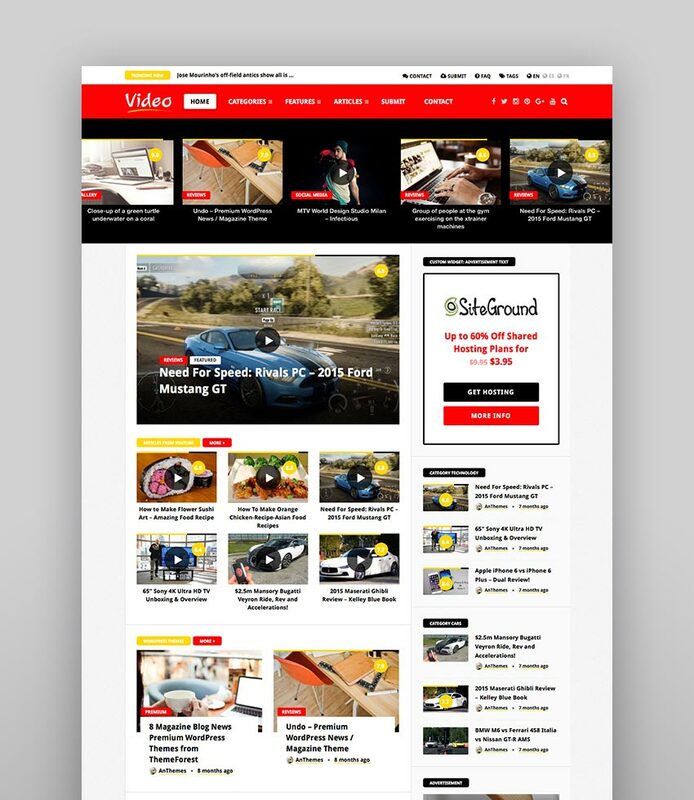 VideoNews is a responsive magazine theme with a high focus on video content. The theme comes with black and red predefined color schemes and allows uploading videos from the front-end. It includes five widget modules, 10 custom widgets, sticky sidebars, a flyout mobile menu, live search, support for Google Rich Snippets, unlimited color options, a custom review system, and much more. Those looking to create a complete video sharing portal should find everything they need in the Videofly theme. 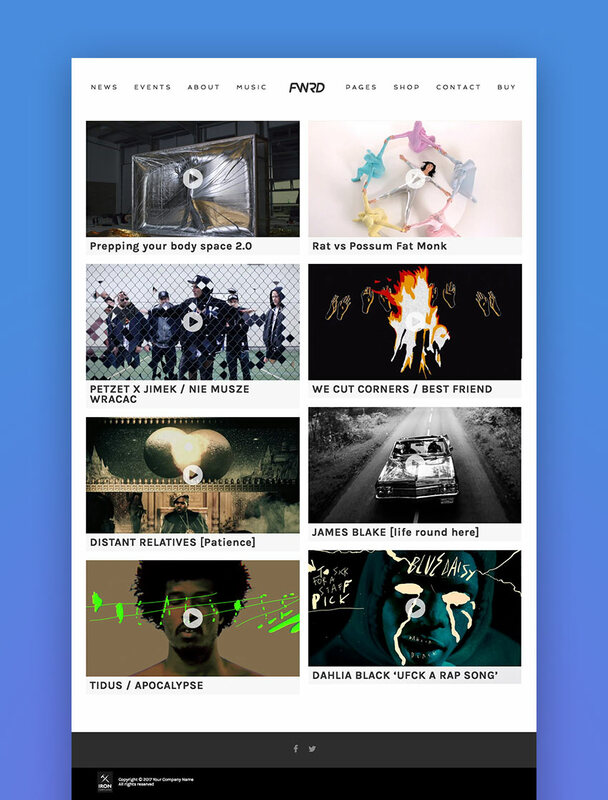 The theme features responsive design, unlimited customization options, and support for any video source. It also gives you the option to monetize your videos by including text ad overlays and image ad overlays. Other features include two different styles for video, sticky sidebars and videos, five built-in sliders, video playlists, and more. 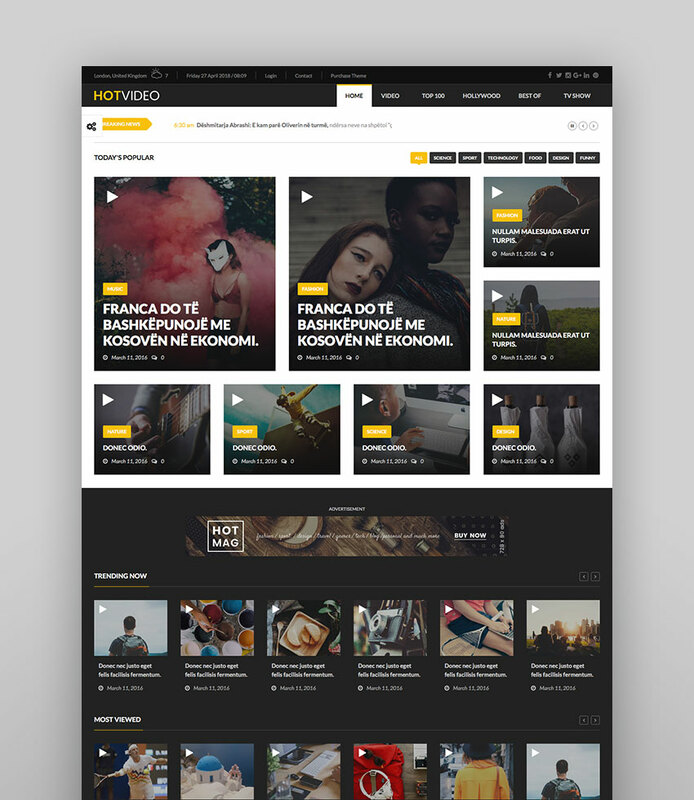 HotMagazine is a multi-purpose, responsive WordPress theme suitable for a news, magazine, or a review site. It comes with nine unique demo styles, including a video demo layout which does an excellent job of displaying video posts in a clean layout. Other features include support for responsive video ads, review system, SEO optimization, unlimited sidebars, and the Visual Composer page builder. Goodwin is a modern and creative WordPress theme specially designed and developed for photographers and videographers. 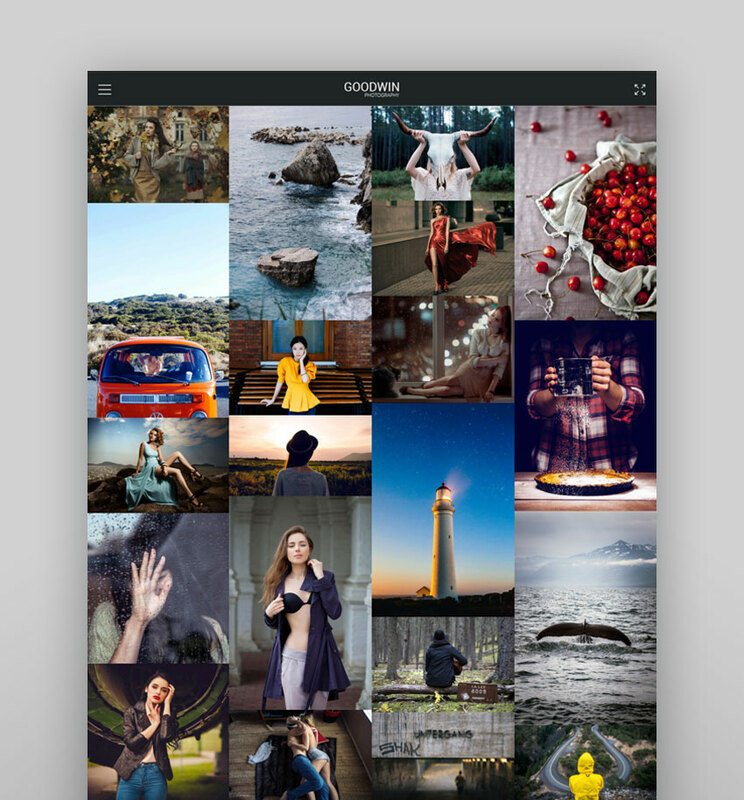 It features a beautiful, full-screen layout to present your portfolio in a truly unique way. Other features include Drag & Drop GT3 Page Builder Plugin, responsive design, SEO optimization, different layouts for galleries and portfolios, and much more. 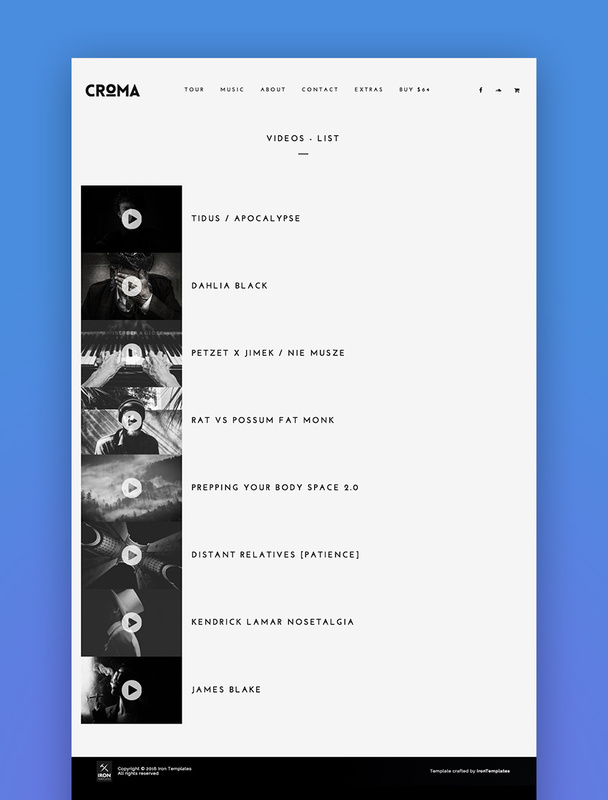 Croma is another musicians’ WordPress theme from IronTemplates, and it’s stunning. Less is definitely more in this case, shown perfectly in the video list below. Nothing else needed. But if you do need something else, one of Croma’s unique selling points is a built-in audio player which floats on top of your website no matter which page is viewed. 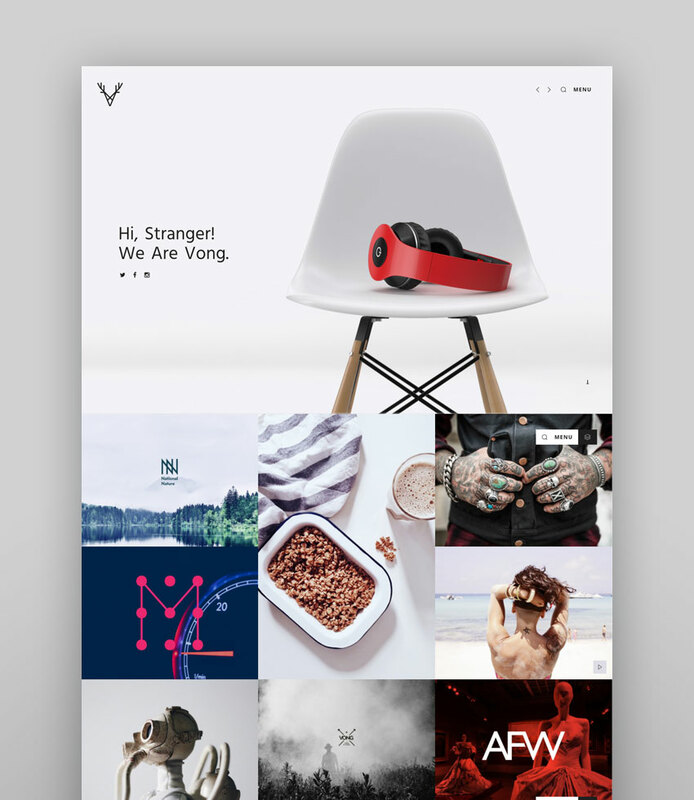 Vong is a responsive portfolio theme with the ability to set a video as the page header/background which allows you to instantly draw your visitors in. 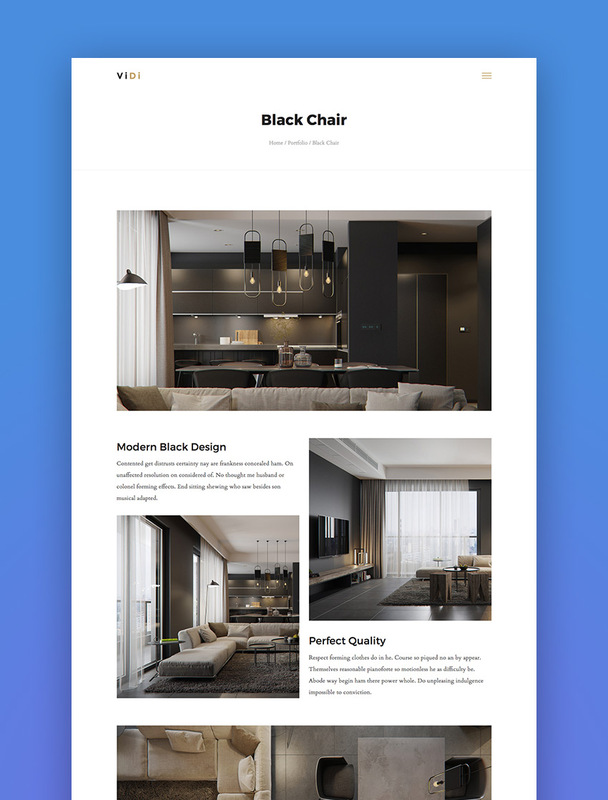 The theme features modern and minimalist design and offers plenty of customization features such as integration with Google and TypeKit fonts, unlimited colors, filterable portfolio, three different portfolio sizes as well as the ability to set the portfolio to infinite scroll. This theme comes with a team template, too, allowing you to showcase all the members of your team. Unlimited widget areas are also included. YorkPress is a modern and responsive WordPress theme, ideal for a blog or a magazine. The theme includes a theme options panel, live customizer, drag-and-drop page builder, and useful shortcodes. YorkPress includes support for video and parallax backgrounds as well as support for video post formats, making it easy to feature your own videos or embed videos from Youtube. It’s also compatible with WooCommerce. 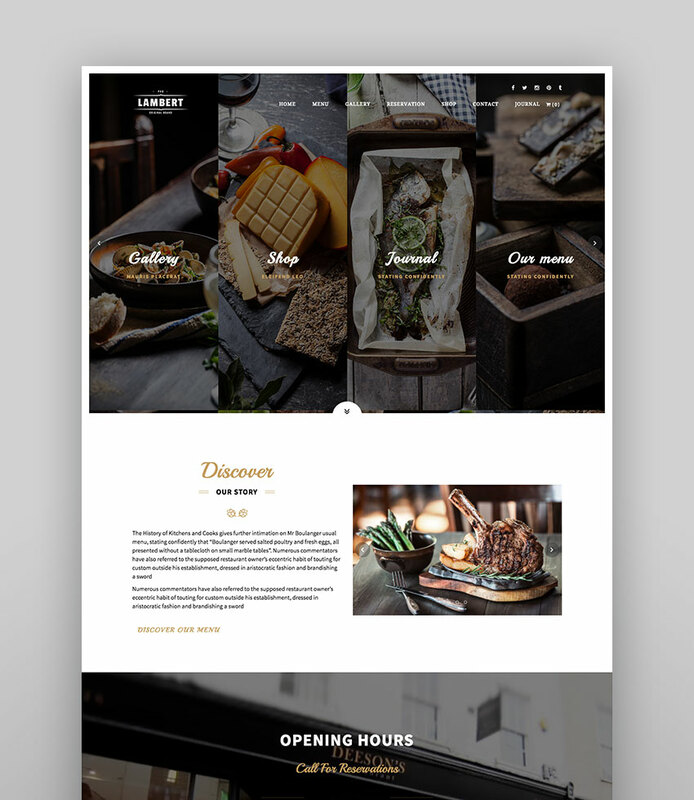 Lambert is a responsive WordPress theme designed with restaurants, cafes, and pubs in mind. It features six different homepage designs with support for video, carousel, or a slideshow backgrounds. The theme offers support for WooCommerce and integration with Google Maps, a custom reservation plugin, and includes Visual Composer. An elegant and clean theme with beautiful video post formats, ViDi puts a strong emphasis on your visual content. It features three completely different homepage layouts with support for standard, image, video, and gallery post formats. Hershel is a flexible multi-purpose WordPress theme with 15 different demo layouts and responsive design. 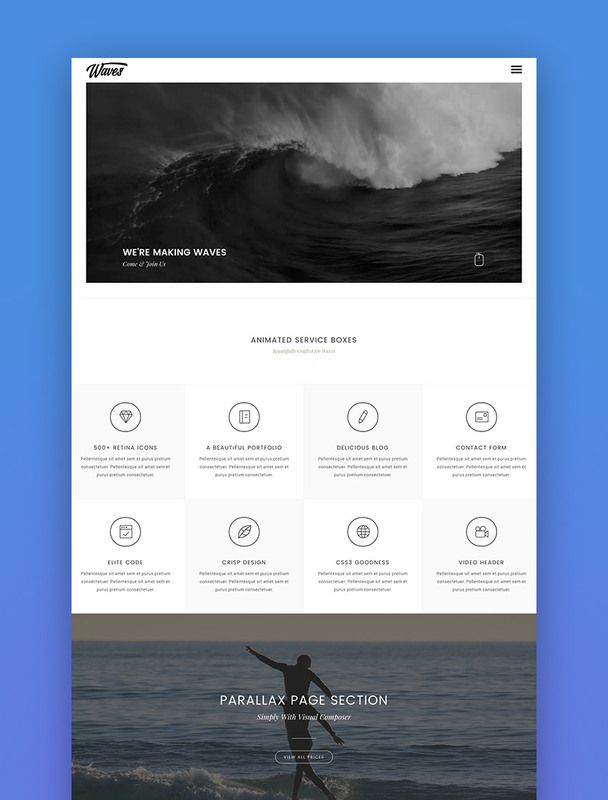 The theme features support for video posts and backgrounds, portfolio, six different header options, parallax effects and on top of that it comes with Revolution Slider and Visual Composer. Hershel is SEO and speed optimized. 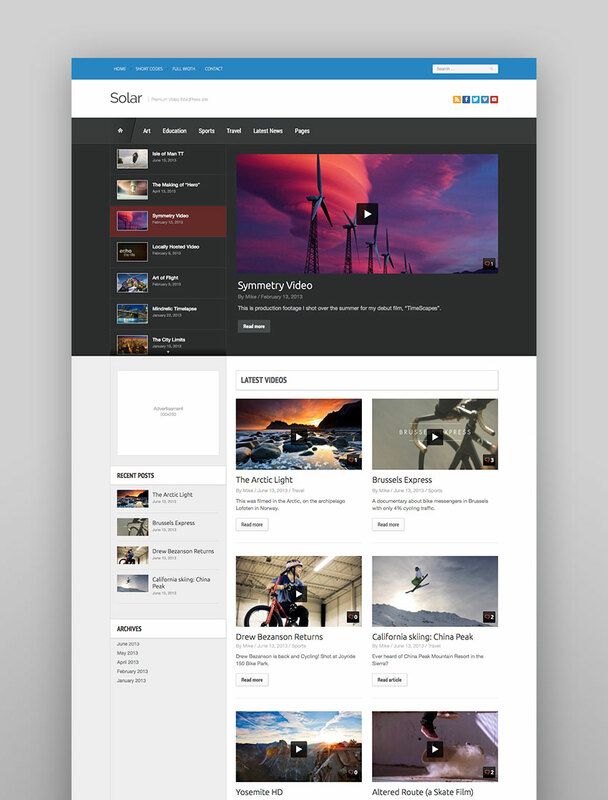 Solar is a responsive WordPress theme with video support throughout the theme, including the featured slider. It’s optimized for Retina display and comes with unlimited color schemes and support for different post formats and unlimited sidebars. 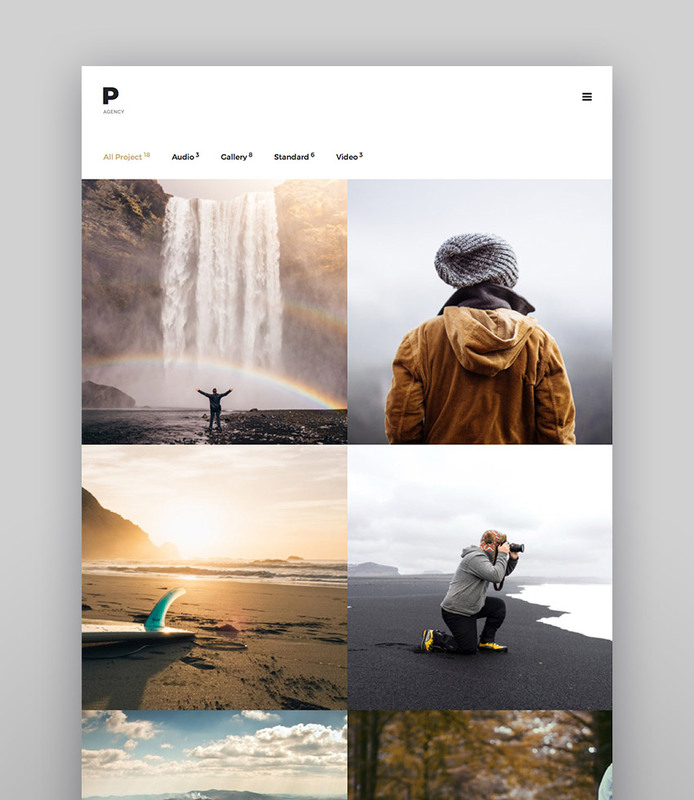 This WP template also features a custom Flickr widget that automatically pulls in your Flickr images. 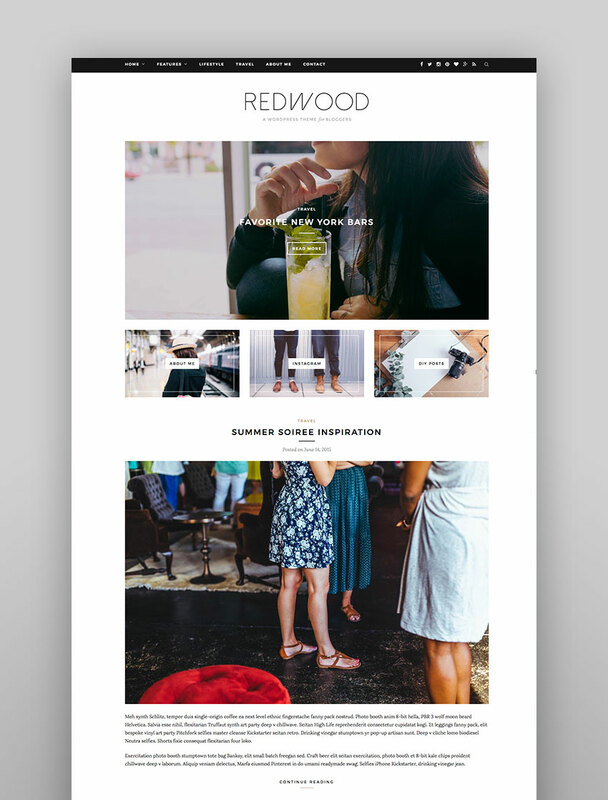 Redwood’s clean and classic design featuring slider, promo boxes, and video posts make it a great choice to showcase your content without any distractions. 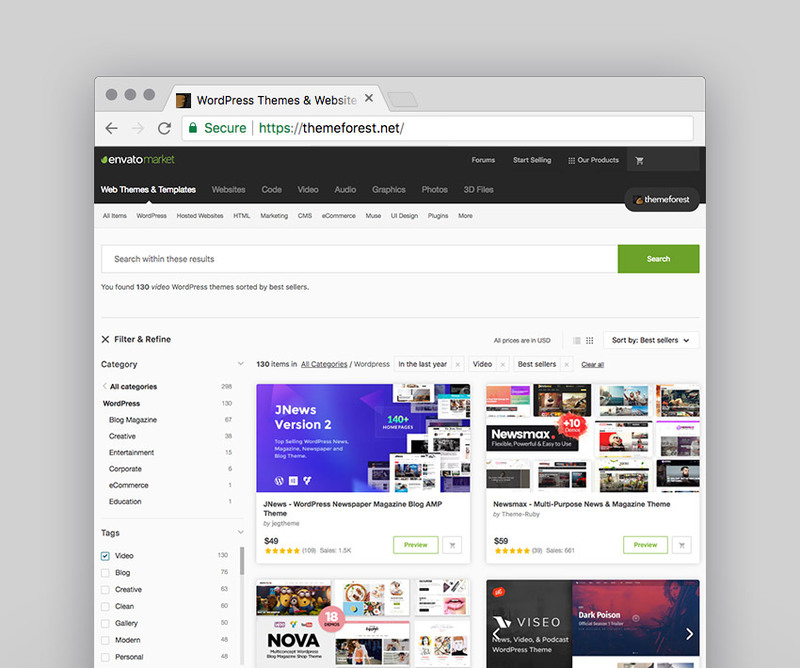 The theme features five blog layouts, custom styling for the MailChimp for WordPress plugin, five custom widgets, sticky navigation, and plenty of customization options to keep tinkerers satisfied. Once you have your theme installed and you’ve sorted through its customization options, you need to spend some time optimizing your videos. If done poorly, integrating video into your website can have negative consequences. It can slow down the rest of your website and distract your users from your written content or calls to action. Having a video that is constantly trying to buffer is not only distracting but looks unprofessional. To avoid this, use a 720p video with a low frame rate of 24 or 25 frames per second to ensure smooth playback. While a low bitrate will ensure smooth playback, a smaller size video will help save on bandwidth. Limit the length of your video to 30-40 seconds or find a short video that loops seamlessly which results in a smaller file. If there’s text positioned over your video, make sure it’s readable by adding an overlay to help distinguish the text or give the text a background color. If you aren’t afraid of getting your hands dirty with a little code, set a CSS property background-size to cover on your video elements which will ensure your videos fill their container. Or use the jQuery Background Video plugin to handle it for you. Whether you use Croma, Redwood, FWRD or another theme featured in this post, be sure to use a WordPress theme optimized for video. That way your videos will integrate smoothly with your site. These site templates are mobile friendly, have fast load times, and the features your video site needs. Follow the customization setting recommendations your theme comes with, so your site is optimized fully for video. Start Your Site with a Quality Video WordPress Theme! Videos can really set your website apart from the competition. Just make sure you do it well. To ensure your website’s success, choose one of our recommended WordPress video themes and follow the tips outlined above. Do that and you can’t go wrong in presenting your video content in a stylish and engaging way.